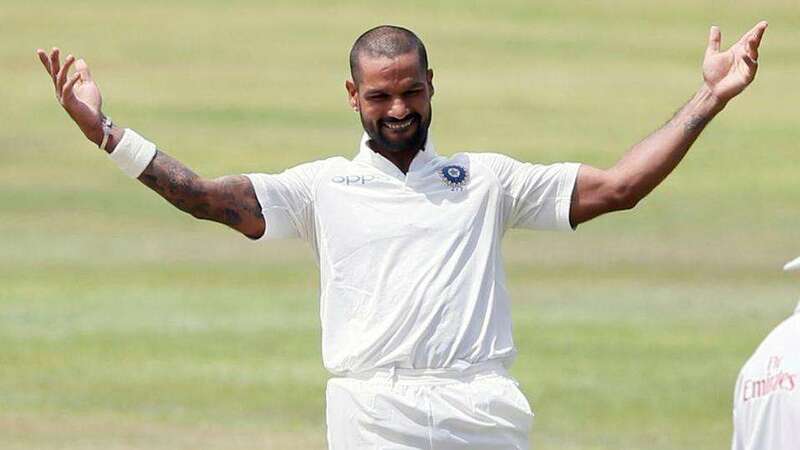 If one major feature that seriously lit up the historic Test between India and Afghanistan, it was the epitome of Shikhar Dhawan’s flawless innings. Centurion Shikhar Dhawan cashed in on a timely arrival of rich run-scoring form. The Test match lived up to its expectations and created plenty of buzz amongst the fans, as an exciting brand of cricket was witnessed on Day One in Bengaluru. After a brilliant start by India, Afghanistan pegged the hosts back in the closing stages of the first day’s play. At one point, India looked to dominate the proceedings as Indian openers Shikhar Dhawan (107) and Murali Vijay (105) slammed tons. KL Rahul, who came after the departure of Dhawan, scored a fifty too. However, the visitors came back after picking key wickets in the last session of the day and restricted India to 347/6 at the closure of Day 1. Full marks to Afghanistan for their never-say-die attitude. They were looking at a mountain when Dhawan and Vijay attacked them, but they made their way back. From 280/2, India lost four wickets for just 67 runs. If one enjoyed the flair of Dhawan’s astounding ton, then Afghanistan’s Yamin Ahmadzai too quite lived up to the billing. He picked 2/32 in 13 overs. Dhawan was in cruise mode in Bengaluru and it looks like 2018 could end up as a special year for him. Let’s look at Dhawan’s progression and the brilliance in which he summed up his innings. When Shikhar ‘Gabbar’ Dhawan gets going, there are few bowlers in the world who can counter him. After the ouster against South Africa post first Test, Dhawan turned the tides in the ODIs. He was flamboyant and the runs started to flow from the bat. He built on the form and there was no stopping his flow. The T20Is followed and he stood tall, helping India win back to back limited-over series. Another fine performance in the Nidahas Trophy, followed by the Indian Premier League 2018 season, Dhawan looked a real swagger. The flurry of matches made him better and he kept in sync with the demands of the game. In Bengaluru against the Afghans, the same form helped him tick. He was solid and never looked out of place in red ball conditions. Dhawan looked on song from the very beginning. The way he took charge and kept the run-rate high, it looked like there was a feel good factor. Dhawan’s mantra of it’s better to get out playing a shot than get out defending, paid off well. The intent was shown and it some how took the Afghans off guard. When Rashid Khan came in the 14th over, Dhawan greeted him with three boundaries. The pressure mounted saw the Afghan spinners bowl poor lengths and to Dhawan’s delight, he cashed in beautifully. When Rashid came back to bowl the 20th, he went for 20. His googly simply could not shake Dhawan. This was a Dhawan, who scored a ton before lunch. That itself gave us an indication of the mood he set out while being on the field. The style reminded so much of that test in Galle where he got 190 before tea. Indian openers Dhawan and Vijay were on a roll and their understanding is commendable. Where Dhawan went on the attack, that helped Murali Vijay play the second fiddle. He took his time to settle in and watched the ball carefully. Dhawan was helped largely by the effective ploy chosen by Vijay. The duo added 168 runs for the first wicket in just 28.4 overs. Dhawan became the first Indian to hit a hundred in the first session of Day 1. Meanwhile, Vijay gained control to slam his 12th ton. The duo have built a solidity factor in Tests at home as they also brought up their 3rd-century stand. Earlier, they brought up scores of 289 versus Australia in Mohali, 2013 and 283 versus Bangladesh in Fatullah in 2015. This click between the duo can be of major help when India play England next in the 5-match Test series in August. One must wonder that Dhawan needs more backing and could have gone on to score a big hundred, but he has done enough to stake a claim for rising further in time to come. Dhawan notched his 7th Test hundred in his 30th match. He is the first Indian to score 100+ runs before lunch on Day 1. He overcame Virender Sehwag’s record of 99. The southpaw also became the sixth player to achieve this feat. The others were Victor Trumper (1902), Charlie Macartney (1926), Don Bradman (1930) Majid Khan (1976), David Warner (2017). This was the 3rd time when Dhawan scored 100+ runs in a session. Only Sir Donald Bradman (6) has done it a number of times. Dhawan’s form can augur well for him. What is important is that he has scored runs at will in all three formats this season. Post this Test, India will begin their tour of UK and if Dhawan can get some big knocks there in both T20Is and ODIs, then it gives him a platform to build for the Test series. The 5-match series won’t be an easy task given the likes of James Anderson and Stuart Broad sharing the new ball. But the confidence gained by Dhawan can give him the onus. With Vijay on the other end, Dhawan knows he will look to play positively. If he feels fresh and keeps the fitness factor strong, it could help him massively. In 2014, he scored a paltry 122 runs in six innings in England and this time he will hope to make the maximum out of his enriching form.